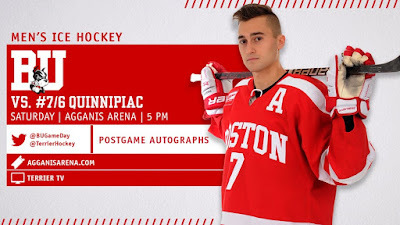 Terriers put their five-game unbeaten streak on the line when they host #7/6 Quinnipiac at Agganis Arena in a 5 p.m. start—due to the impending snow storm. They’ll also be looking to extend their all-time record against the Bobcats, which now stands at 3-0. Quinnipiac is 16-5-1 overall, although it is 1-2-1 this month. Goaltending has been split between junior Andrew Shortridge (0.98GAA, .961SV%) and sophomore Keith Petruzelli (2.30, .909). 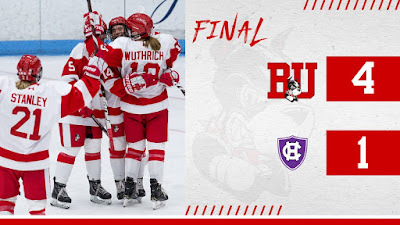 The offense, which averages 31 shots and 3.68 goals per game, is led by sophomore Odeen Tufto with 29 points, senior Chase Priskie (27) and former Terrier Brandon Fortunato (20). Clayton Keller scored his 10th goal, which gave him 100 career points for Arizona, which lost to Pittsburgh in overtime, 3-2. Evan Rodrigues scored for the third consecutive game and Jack Eichel contributed his 36th assist, but Buffalo fell in overtime, 4-3, to Vancouver. Terriers began their home-and-home with Holy Cross by defeating the Crusaders, 4-1, in Worcester for their fourth straight win. BU goal scorers were Jesse Compher, Mary Grace Kelley, Alex Allan and Courtney Correia. Freshman Kate Stuart got the start in goal and stopped 15 of 16 shots. The teams are back on the ice Saturday at Walter Brown Arena with puck drop at 3 p.m.